If you've ever wondered why the English language is as quirky as it is, you would do well to read By Hook or By Crook by David Crystal. Crystal is the author of numerous books about the English language, most notably the excellent and fascinating Cambridge Encyclopedia of the English Language. 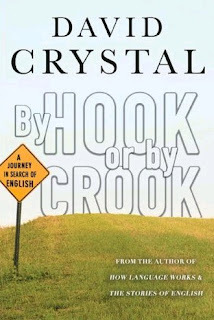 In By Hook or By Crook, Crystal takes a meandering journey throughout England, along the way encountering dialects, pub/road signs, and local word usages that he uses as springboards to delve into why we speak the way we do today. Some of the tangents he takes are a bit unusual, such as how a single bee can give directions to a source of nectar to the entire hive, but his writing style is highly entertaining and he does eventually tie the topic back, somehow, to language. He also throws in some interesting personal experiences, such as his encounter with William Golding at a literary event. I had never heard that Golding was a irritable old grouch-bag, but somehow the news doesn't surprise me! There are also many interesting facts to be gleaned from between the pages of this book, such as that St. John of God is the patron saint of the book trade. Another story which I found fascinating involved the Yale professor who taught parrots an extinct Indian language and then incorporated them into an art exhibit. Some of the tangents do go on a bit too long, such as the extensive discussion about why the word "swan" appears in so many pub names. Still, the book is quite interesting and written by someone who clearly knows his stuff. I learned a lot from reading the book, and I plan to dip into it now and again to reacquaint myself with the many odd facts that help to explain how our language evolved. Sounds interesting. I'll put it on my reading list. It takes a while to get going, but there are so many interesting tidbits sprinkled throughout that I'm glad I stuck with it! Just thot you’d be interested in these verses I love which’ll help you wiseabove. May God flagrantly bless you, my friend, and may the Trinity always put two options in thy Finite Existence (L or R) so you know the Way home to Heaven Above. May I meet you Upstairs and we’ll go for a beer? I’d like that (yes, ma’am, God has beer, the most full-fill-ing in the universe).